Several teams were out testing at Donington Park yesterday ahead of the 2015 Dunlop MSA British Touing Car Championship season. It was the first opportunity for MG’s latest signing – Jack Goff – to get behind the wheel and put some miles on his new car. Running in a plain, unbadged livery, Goff racked up 300km of valuable track time (around 100 laps) as the Stokenchurch-based driver began his preparation for the forthcoming campaign. The BRDC SuperStar ran alongside fellow Triple Eight driver Andrew Jordan in his Pirtek liveried MG as both drivers set about their respective pre-season test programmes. For Goff, his programme concentrated primarily on familiarisation with the MG and simulated race runs, as he got his first taste of the car that delivered the MG-backed squad the manufacturer/constructor title last season. “It was a really good first day back at school; the Headmaster didn’t tell me off too much,” quipped a happy Goff. “It’s been a long time since I got behind the wheel of an NGTC car and it was good to get so many laps in and blow away a few cobwebs. 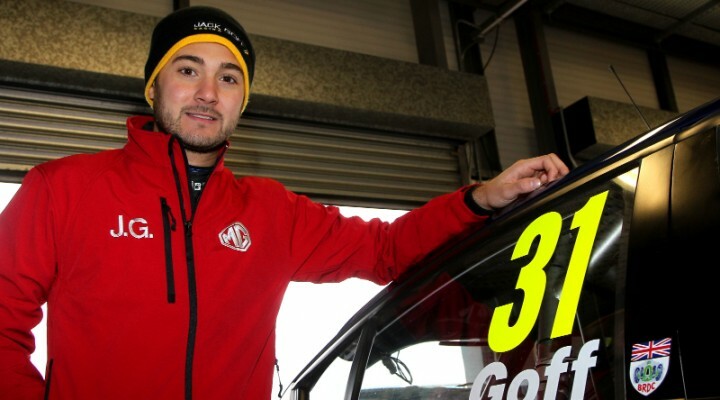 After experiencing both Vauxhall and Volkswagen machinery over the past two seasons in the BTCC, Goff was pleasantly surprised by the performance of the MG around the fast and flowing National Circuit, getting a taste of things to come in 2015. “The VW was a step on from the Vauxhall, but this (the MG) feels like a bigger step on in terms of differences again. My initial thoughts are that the MG feels so much stronger; it really encourages you to push and I’m looking forward to doing just that at Snetterton on Friday,” explained Goff. With his first test complete, Goff now heads to Norfolk’s Snetterton circuit on Friday (6th March) before heading to Brands Hatch in Kent (17th March) and then returning to Donington Park for the series’ Season Launch and Official Test on Tuesday 24th March. Jordan, now on his fifth day with the Triple Eight-prepared MG, had another positive day behind the wheel, primarily focussing on qualifying and race simulations ahead of the Donington Park weekender in April. The 2013 BTCC Champion also has a test at Brands Hatch scheduled before the season opener, returning to the scene of his title win in under a week’s time on the 12th March.